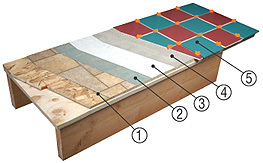 The TAVY Thin-Skin Two Part Underlayment System was developed to provide an underlayment for tile that could be installed over any surface without adding additional height to the sub-floor. 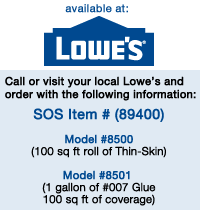 The Thin-Skin System is so simple that it can be installed by both professionals and DIYers. The TAVY Thin-Skin Underlayment is simply trimmed to size and glued to the existing area, using TAVY #007 Glue, to create a surface suitable for setting tile. It’s as simple as elementary school arts and crafts. © 2010 TAVY Enterprises, LLC. All rights reserved.